Class B Motorhomes bridge the gap between city streets and cross country adventures. 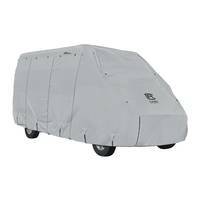 Using a Class B RV Cover when storing your camper van will help protect it from damage caused by UV rays, rain, and snow. 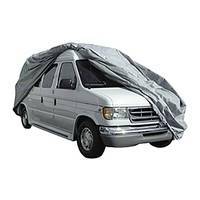 We offer ADCO SFS AquaShed along with Classic Accessories PermaPRO cover for all weather protection. The best way to choose the correct size is to measure your unit. You should measure your units overall length including everything you want protected. Going by RV manufacturers specs can often result in choosing a product which is not long enough, as the manufacturers do not always include bumpers, etc. Classic Accessories has offered exceptional products since 1983. They have expanded from a small basement company to a large business that ships nationwide every day. They ensure that you have the most stylish and efficient product on the market. PermaPRO ripstop is 100% woven polyester for excellent tear resistance. Protection against rain, UV rays, dirt and dust. Extra-long zippered access panels with air vents. ADCO Products has 50 plus years of experience manufacturing protective RV products, making them the oldest protective cover company in North America. ADCO is also a family owned business, and they take pride in every item shipped from any of their facilities worldwide. Check out our tyre and propane tank covers. Triple-layer polypropylene material for extreme protection that beads water on contact. We stock the finest quality materials from leading manufacturers like Classic Accessories and ADCO. Our products are strong, durable, and built to last. Whether you have a Roadtrek, Winnebago, or Pleasure Way, we can protect your Class B RV in the off season.